You have added Turquoise Anarkali Suit with Floral Embroidery to your Shopping Bag! 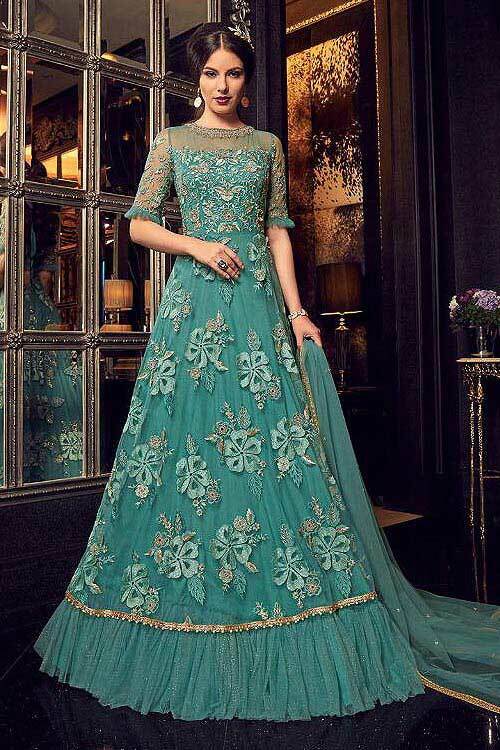 Dress like a princess with this turquoise floor-length anarkali gown! This layered anarkali suit is accentuated with beautiful floral embroidery along with sequins and beads work. Embroidered top layer features beaded lace at hem. The bottom layer is frilled/ruched with shimmer net. Embroidered bodice features sheer neck design with embroidered round neckline. The designer suit also features embroidered short frilled sleeves. The look gets complete with matching net dupatta with golden lace border.